The Hangar 9 Extra 300 ARF. 35% Large Scale Model Aircraft. The New Hangar 9 Extra 300. 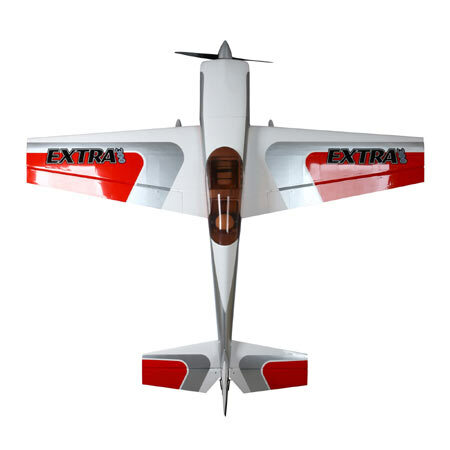 A Giant Scale Airplane, for 3D RC Aerobatics. This is definitely LARGE scale airplane! With a wing span of 105" and an overall length of 98", it should finish up weighing between 27 and 30lbs. 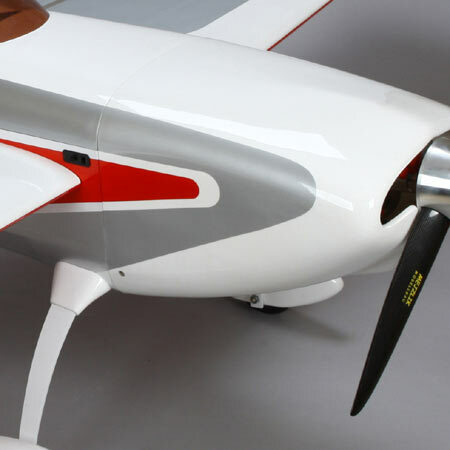 Designed by Mike McConville, this large scale model airplane sets new standards for completeness and quality. Constructed from laser-cut balsa and ply, it is masterfully covered in a striking UltraCote color scheme. It is specifically intended to be powered by a Desert Aircraft DA 100L or DA120 RC gas engine and hardware is included to mount either one. Twin exhaust troughs are built in to the fuselage to accommodate a twin exhaust system. All control surfaces are hinged and control horns are mounted, even the gas tank is installed, so completion time should be at a minimum! If a smaller version of this model is what you prefer, then take a look at the Parkzone RC Extra 300, this smaller electric powered model maybe just what the doctor ordered! The wing features a double carbon fiber spar design and the usual carbon fiber wing tube. Two high torque servos are used per aileron and the use of a JR Match Box is recommended to synchronize the servo movements. A total of 8-servos are needed- 4 for ailerons, 2 for the elevators (I per side), and 1- each for the rudder and throttle. The recommended servos are JR DS8911HV Ultra Torque Servo. These units generate 470 oz-in. of torque and have a speed of 0.12 seconds for 60 degrees of travel, using a 2S lipo battery. 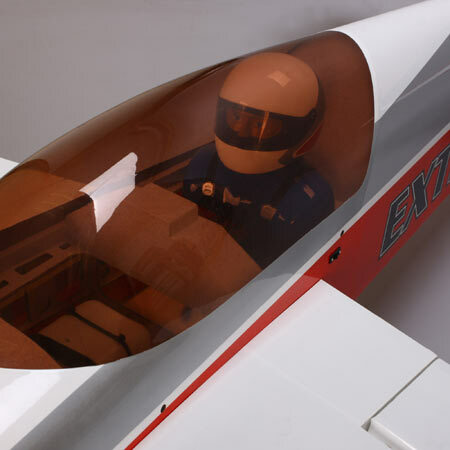 Here we can see the fiberglass canopy hatch and note that a pilot figure is included. The hatch is removed to access the wing bolts for each wing panel and the radio gear. Note that it has a nice tint, sun shade for the pilot! On sunny days it can get very hot inside the fuselage. It is a good idea to make a few small holes in the base to vent hot air and place a cloth over the canopy if the model is sitting in the sun for extended periods. The quality of finish and attention to detail is evident in the photos and the Hangar 9 Extra 300 sets a new standard in excellence for ARF airplanes! The spinner required is a Tru-Turn product. It is a 4 1/2 in. diameter "Ultimate" style. 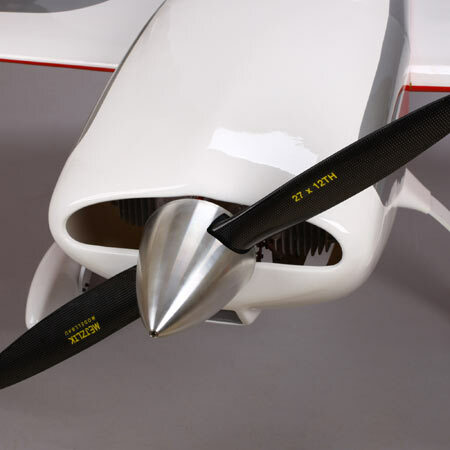 It is available for 2, 3 and even 4 bladed props. Take a look at the Tru-Turn site for full details. Tru-Turn also have a full range of adaptors for a wide range of engines. Here you can see the flush mounting of the cowl. The hardware package is of excellent quality and features 4-40 ball links and titanium push rods. Assembly time for the Hangar 9 Extra 300 is quoted as 20+ hours-but I would not be surprised to find that maybe a bit generous. Bolting in servos and an engine should be quicker than that! However, enjoy every moment of what should be a delightful experience. I would think that the DA-120cc would be the ideal engine to use in the Hangar 9 Extra 300, for 3D aerobatics. This twin cylinder 2-stroke gas engine is available with a twin exhaust system and this model has troughs built into the fuselage to accommodate this feature. Ready for final assembly and equipment installation. Superb finish and a model you will be proud to own. Very accurate and repeatable construction. Spinner not included. At this price, at least a 2-blade style should be in the box! Please note that all the photos, on this page are from the Hangar 9 web site. Name: Hangar 9 Extra 300 ARF. Type: 3D aerobatic giant scale. Wing loading: 31.1 oz/ sq.ft. Radio req'd: 4-channel min. Computer radio req'd for mixing. RC servos req'd: .8-high torque.